Amid the warm Mexican Caribbean climate, spectacular natural beauty and stunning Mayan culture, Casa Whitley inspires relaxation, tranquility and a true retreat from everyday life. 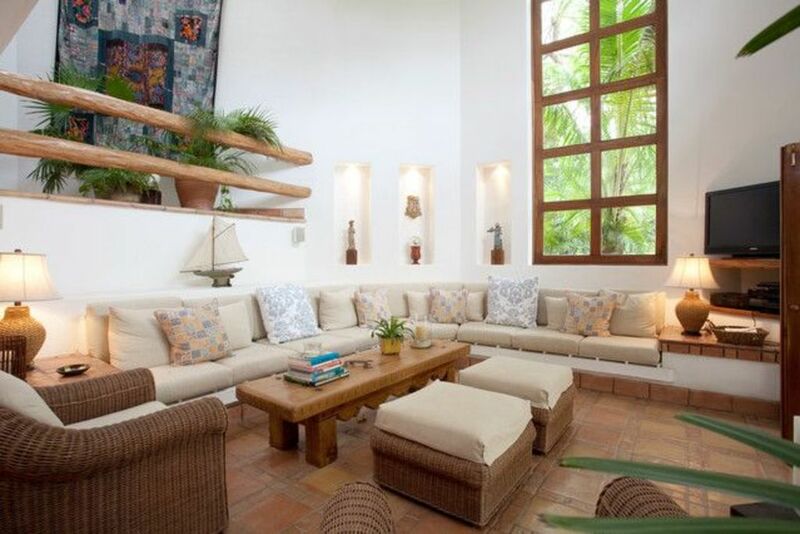 Located on the Riviera Maya, in the exclusive gated resort community of Playacar (40 minutes south of the Cancun airport), Casa Whitley is an exquisite hideaway for only the most discriminating guests. The sun-drenched ambiance is reflected through the simple yet elegant architecture of the Spanish Colonial design by architect Angel Eslea. Interiors were designed by the owner, renowned Connecticut interior decorator, Carol Whitley. Double height ceilings, rough-sewn wood beams, skylights and custom Talavera tiles add to the home's unique style. A Mayan waterfall spills into the sparkling swimming pools reflecting a lush landscape of tropical plants and palms. A fully equipped gourmet kitchen awaits the amateur chef. The large living room has a 18-foot wrap around sofa, 2 large rattan arm chairs and antique coffee table. The center piece of the dining room is a massive 9-foot mahogany table and rattan arm chairs to encourage hours of dining pleasure. All the main rooms spill out onto the terra cotta tiled terrace and the pools beyond. The Casa is perfectly situated on the 4th hole of the beautiful and challenging Robert Von Hagge Golf Course. The Spa at Playacar Golf Club, within easy walking distance, offers luxurious and relaxing treatments. Three bedrooms and a master suite sleep a total of 10 guests. (The fifth bedroom is off the laundry room and is very small with bunk beds and a private bath. It sleeps 2. Perfect for kids!) Four and a half bathrooms, some with double sinks, a sky-lit tub and showers, are each enhanced with hand-made blue and white tiles. Each upstairs bedroom has its own terrace. The Casa is fully air conditioned with individual room controls. Our concierge will check on you daily. He will arrange transportation, private chef service, reservations for spa, restaurant, golf and sightseeing. Every detail to make your vacation truly memorable. Only a short walk away (less than a mile) is the beach, ferry boat to Cozumel and Playa's famed 'La Quinta' (5th Ave). The pedestrian street is lined with many shops and international cafes. La Quinta comes alive at night with strolling musicians and lively international conversations. But the best of Playa is the miles of silky white beaches kissed by the sparkling turquoise waters of the Mexican Caribbean. The friendly atmosphere of Casa Whitley, its romantic nights, myriad of daytime activities and its location in the heart of the Mexican Riviera Maya, make it the perfect place to spend your vacation. This is our family's second holiday at Casa Whitley- Amazing , Amazing , Amazing !!! Without a doubt every detail; from the point of making contact with Carol ,the property owner to our departure to the airport is a seamless easy process. Traveling with a family of 9 and every imaginable need is taken care of for everyone ! Carol is meticulous, highly communicative , and her home is both stunning and relaxing. You're not more than a 10 minute walk to the beach, town , or a taxi...so easy. If you want an extraordinary holiday with every thing at your convenience and the beauty of a warm and design-friendly home this is the real deal. Thank you Amy...it was our privilege to host you and your lovely family again this Christmas. Looking forward to 2020 and your return. Three letters...... W O W!!! Casa Whitley exceeded our expectations. We were a group of 10 girls on a girls trip (bachelorette party). Half of us were able to arrive early and, with the help of concierge, our transportation was graciously awaiting us at the airport. As soon as we pulled into Playacar Phase II (the community) we were "ooohhingh and aahhhhing"! From the vibrant landscaping, to the amenities, and native wildlife...Casa Whitley felt immediately like home. We set up decorations to welcome the other group and the bride-to-be. Needless to say, when she arrived, our guest of honor was beaming with excitement and surprise! We spent the first day just relaxing by the private pool, ordering pizza delivery, and unwinding after our flight. The beach was within walking distance and between that, shopping, and grazing on delicious food we thoroughly enjoyed all Playa del Carmen had to offer. Monica and her husband Chema were lovely, polite, and the of utmost help. She was able to arrange us extra transportation for our big night out on the town. Blanca served us the most exquisite traditional Mexican Breakfast on the day of our departure which included Migas with freshly made salsa, eggs with queso, yogurt, granola, fresh fruit, milk, and freshly squeezed orange juice..."QUE RICA!" She was the sweetest and cutest ever throughout her morning with us. The owner, Carol, was able to walk us through every step of the process and made the trip for our large group go off without a hitch. I cannot express enough how much fun we had, how safe and comfortable we all felt, and how enjoyable our stay was at Casa Whitley...but don't take my word for it. You MUST see this little piece of Heaven on Earth for yourselves. God Bless & Thank you Carol again for your hospitality! Thank you Chelsea...it was indeed a pleasure to host your party. We look forward to having each of you as our treasured guests in the future! My friends and I stayed at Casa Whitley while visiting Playa del Carmen in celebration of our 30th birthdays. We had a wonderful time! The home was clean and well maintained. The kitchen and common areas were spacious, and allowed all of us to enjoy each other comfortably, and the bedrooms were spacious and numerous enough to allow solitude when desired. Carol, the owner, was helpful during every step of the process from making the reservation, to our arrival, to check-out and returning our refund. She and Maria, her concierge, provided several recommendations concerning dining, activities, and even the best spots on the beach. Yet I must say, as far as the excursions and airport transport, I found that we were able to save money by arranging them on our own. The house is about a 10-15 min walk from the beach. Most times though we caught a cab as it was crazy hot to get into town (cabs were $9 USD). 5th Avenue had lots of shopping and dining, and most were reasonably priced. Overall, we had a fabulous time. My only regret is that we didn't stay longer! I would highly recommended Casa Whitley to others. I spent the week at Casa Whitley with my best friends celebrating my 40th birthday. The house is beautifully decorated and was perfect for us! Great neighborhood, easy access to beach and Playa. The concierge and chef services were brilliant. Huge recommendation from me as well as my friends. Will be back! Thank you for your kind words. It was a pleasure hosting you and your friends. Slightly higher daily rate for less than 7 days. Rates do not include 19 % IVA tax. Rates are in US dollars and subject to change without notice. Reservations require a 50 percent deposit within 7 days of booking for confirmation. The balance of rental plus security deposit (1000 US) must be received 31 days prior to the arrival date. Holiday rentals (Christmas, New Years) are NOT refundable.